The study was undertaken with the aim to evaluate association between inflammatory changes in the cervix with different predisposing factors related to cervical carcinogenesis. Routine outpatient cervical cytology has been carried out in 19,449 women between September 1991 to August 2002 at Queen Mary's Hospital Lucknow and 8354 of them have revealed inflammatory smears (42.9%). Inflammation was found to be associated with trichomonal infection and mild dysplasia (LSIL) in 4.8% and 5.1 % of cases respectively. Both these associations were pronounced in younger women upto 30 years of age. Further the inflammatory smears were frequently seen in women with clinical lesions of cervix (35.1%) and those complaining of vaginal discharge (13.7%). 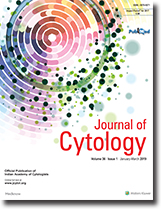 The study points out the need for adequate treatment of inflammation detected on cytology and post-intervention cytology checkup to rule out any persistence, which must be investigated by colposcopy to detect any precancerous manifestations in the cervix. This study was undertaken to evaluate the efficacy of aspiration cytology in the diagnosis and classification of leprosy. A total of 130 suspected leprosy cases were evaluated for detailed cytological features. Histology was available in only 100 cases. Leprosy cases were classified according to Ridley - Jopling spectrum. On cyto-histological correlation in polar tuberculoid and polar lepromatous group 100% concordance was observed, whereas, it was 94.12% in borderline tuberculoid, 93.75% in borderline lepromatous and 50% in midborderline group. Overall diagnostic accuracy was 87.57%. Borderline group posed problem in sub classification, especially the midborderline. A total of 12 cases of palpable breast lesions with histopathological diagnosis of proliferative breast disease were selected and their fine needle aspiration smears were scored. The scoring system was devised for mammographically detectable non-palpable breast lesions. The same cytological criteria along with cytoarchitectural patterns such as swirling of epithelial cells and lumen formation were used in smears from palpable breast masses in the present study. The results showed 80% concurrence with histological diagnosis of proliferative breast diseases without atypia. Diagnosis of ductal carcinoma in situ was not possible by using the criteria. The cytological criteria and architectural patterns increase the accuracy of diagnosis in the spectrum of proliferative breast lesions. Results of 30 years routine cytological screening has been evaluated to assess its impact in minimizing the incidence of cervical carcinoma in the segment of population screened. The data was derived from the routine cervical cytological studies carried out in 29,321 women attending Gynaecology OPD of Queen Mary's Hospital, Lucknow between April 1971 to August 2002. Incidence of carcinoma cervix was found to be 0.5% (167 cases). The halving of the total observation period revealed remarkable decline in detection rate of carcinoma cervix from 1.1% in the initial 15 years to 0.4% in the next half of the study. Cervical cytology was also found effective in detecting malignant smears in 12 women with apparently healthy cervix (7.6%). The study points out some relationship of Herpes simplex infection with carcinoma cervix and the disease was more prevalent in women of high age and parity. The accumulated data asserts the utility of cytological screening in curtailing the menace of cervical carcinoma under low resource settings. The use of cytology, vaginal pH and colposcopy as adjuncts to clinical assessment of efficacy of traditional Ayurvedic douche alone in treatment of uncomplicated leucorrhoea, has been evaluated in this study. Forty two cases of uncomplicated leucorrhoea without pelvic inflammatory disease or associated gynaecological or systemic pathology formed the study group. History, clinical examination, Papanicolaou (Pap) smear, gram stain, vaginal pH, and colposcopy were carried out before treatment, at 2 weeks post treatment and monthly examination. Daily douches with modified Panchavalkal (decoction from barks of F bengalensis, F religiosa, F infectoria, F glomerata and Alebbeck 25gms each), were given for 14 days. Symptoms were evaluated by a diagrammatic visual grading score. Thirty six cases (85.7%) had clinical relief or cure (p < 0.001; Chi square test). The symptom score was reduced from 5.4 ± 1.9 to 2.2 ± 2.2 (Mean ± SD) at 2 weeks and 2.3 ± 2.2 (Mean ± SD) at 1 month (p < 0.001; paired ‘t’ test) at 2 weeks post treatment. Out of 29 cases who had cervical erosion, 20 cases showed reduction in area of erosion whilst no change was seen in 9 cases. Colposcopy (n=21) confirmed reduced vascularity, inflammation, discharge and epithelialisation of transformation zone in 19 cases. Vaginal pH (n=28) was reduced in 13 and remained normal in 7 and remained same in 4 cases. In 4 cases there was a nonsignificant rise. Pap smears (n=37) showed improvement in severity of inflammatory changes in 25 cases. Specific infections were seen in 24 cases initially, and in 15 cases at 1 month. Apart from symptoms and signs cervical cytology, colposcopy and vaginal pH were very useful in evaluation of the traditional Panchavalkal douche treatment of uncomplicated leucorrhoea. Multiple infections and resistant cases were identified. Panchavalkal provided symptomatic relief in 85.7% of cases. Cytodiagnosis of salivary gland lesions is a challenging job to the cytopathologists due to varied cytomorphology. In our Institute, a total of 852 salivary gland lesions were cytodiagnosed in last 10 yrs of which 25.25% were cystic, 54.45% were inflammatory and 20.30% were neoplastic lesions. Total no of malignant lesions were 32 (3.87%). Out of 173 neoplastic lesions we failed to classify the lesion properly in 11 cases, where we missed either the neoplastic nature of the swelling or failed to differentiate a benign from a malignant tumour. Here we have discussed those 11 cases with review of slides, probable causes of error and measures to rectify. A case of intra-abdominal desmoplastic small round cell tumour (DSRCT) occuring in a 9 year old boy, diagnosed by fine needle aspiration cytology is being reported for its rarity. Hepatocellular carcinoma (HCC) is rapidly fatal neoplasm of high worldwide prevalence. Fibrolamellar carcinoma (FLC), a variant of HCC, lacks the dismal prognosis of ordinary hepatocellular carcinoma (o-HCC) and is characterized by diagnostic histological and cytological appearance. Although FLC is quite uncommon, it accounts for a relatively large proportion of this malignancy in young adults. We report herewith a case of a 38 year old male diagnosed by Ultrasound guided Fine Needle Aspiration Cytology (USG FNAC) as FLC and confirmed by histopathology. Report is made of the fine needle aspiration (FNA) cytologic detection of a huge retroperitoneal malignant fibrous histiocytoma which had caused massive abdominal distention. Ultrasound and other investigations revealed that the other intra abdominal organs were normal. The cytological findings paralleled those seen on tissue sections and were characterized by good cellularity composed of two different population of cells and several giant cells. Fibroblastic and histiocytic differentiation was detected in the cytological preparations. It is concluded that malignant fibrous histiocytoma present retroperitoneally may be accurately diagnosed by FNA cytology. Neurofibromas and Schwannomas are benign neurogenic neoplasms of Schwann cell derivation. Neurofibromas occur slightly more frequently than schwannomas and tend to occur in younger age. In neurofibromatosis, tumors are multiple and often deep seated and tend to grow to a large size. The preoperative diagnosis of these lesions is of significant clinical utility. If the lesion is small and does not cause pain or neurologic deficit, it need not be removed. We diagnosed a case of intraabdominal neurofibroma by ultrasound guided fine needle aspiration biopsy (FNAB). The objectives or this study were to determine the utility of FNAC in the diagnosis of filarial infections involving the subcutaneous tissues and also to study the incidence of filariasis in Goa. We report three rare cases of filariasis in these sites. Two of these were subcutaneous lesions caused by filaria of Mansonella streptocerca and one lesion caused by the adult worm of Wuchereria bancrofti. Filariasis is a major health problem in certain parts of India. However in Goa, filariasis is not common. These cases discussed were seen in migrant labourers who come to work in Goa from other states of India. In two cases microfilaria were seen and in one, an adult worm was seen. Hence FNAC is a useful tool to diagnose filariasis.